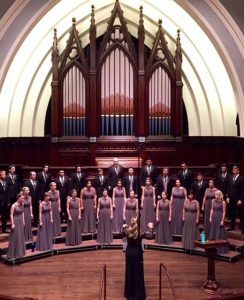 Around 37 collegiate choirs flocked from around the country to compete in the most elite collegiate choral conference in the United States on the weekend of Oct. 14. Known as the National Collegiate Choral Organization conference, it was held at Portland State University. I shadowed this event under one of the adjudicators, Nancy Sollajian. “Only the best of the best are invited to the conference and I cannot wait to see what these choirs have to offer our ears,” said Sollajian. Many of the students who participated have hopes of becoming choral conductors themselves one day. As I walked into the auditorium at Portland State University, the smell of old wood and brass from the instruments filled my nostrils. The Portland State Chamber Singers opened the conference with the intricate, difficult, and beautiful piece, “Sleep”, by Eric Whitacre, showing off their fabulous phrasing and pristine musicianship. As they performed, I closed my eyes and was suddenly teleported to a spring meadow filled with lavender flowers. The melody was the swift breeze in the air and their harmonies were the chirping of birds. The audience loved the piece and many were in tears. When the applause died down, NCCO coordinator Tim Peck thanked everyone for coming to the festival. “I am so very grateful to be a part of a festival that celebrates life through music in this time in our world which is full of death and destruction,” said Peck. After the opening ceremony ended, many choirs would go on to perform and be adjudicated. Some of the groups that were featured were USC, UCLA, BYU, NYU, and even Julliard. Of all the choirs that performed their repertoire on the first day, the closing choir of the night, Azusa Pacific Chamber choir, truly took my breath away. Led by Michelle Jensen, who received her doctorate at USC, the choir was not only talented but the most poised. They seemed to glide quietly into the auditorium, which they received many positive remarks from the judges for. The ladies wore grey gowns that draped at their feet, and their men wore black tuxedos. They performed a piece called “O Magnum Mysterium” by Morten Lauridsen. The piece flowed so beautifully that three of the five adjudicators were in tears by the end of the piece. After hearing and witnessing this choir in action, I had to catch up with their conductor backstage. “Three choir retreats, eight hour rehearsal weeks, and solid friendships are what makes the singers who they are,” said Jensen. On the final day, three finalists were chosen out of the choirs that performed and they were USC, NYU, and APU. As I returned the next morning, I could still hear the sweet ringing of the melodious voices of the singers in my ear. The three finalist choirs competed for first place gold at NCCO, a title many choirs dream of earning. I expected APU to blow the other choirs out of the water, however, it was USC with their rendition of “When You Believe” from The Prince of Egypt that won the competition. What was even better was that they dedicated their piece to all those affected by the Las Vegas shooting. They arrived with the victims’ names on silver balloons and released them as soon as they were finished singing. The room fell silent to respect the fallen and finally rewarded USC with the envied gold. The NCCO choral festival was an enlightening experience I’ll never forget filled with stunning music, great people, and a positive message of love and unity even through this dangerous time.